HOT DOG DAYZ!!! : Record Review: Blazing Eye - Self-Titled 7"
Record Review: Blazing Eye - Self-Titled 7"
This is some of that rhythmic punk that's making the rounds lately. Kind of like Dawn of Humans (with whom they are currently label mates) but more on the crusty and menacing side than the weird and experimental. 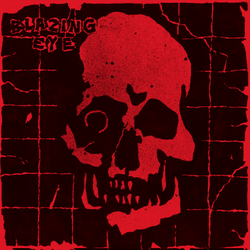 Blazing Eye is a quartet out of Los Angeles that share membership with Raw Ponx-affiliated acts like Drapetomania, Tuberculosis, and Sadicos. They have gained a bit of notoriety following a trio of intriguing demo tapes dating back to 2013. This is their big vinyl debut party, and it shows them evolving, albeit subtle, both in terms of style and production. They’ve added some atmospheric, brooding elements that lend them an air of darkened mystery. And the vocals hold a more prominent place in the mix this time around, which makes it easier to decipher the lyrics. To label this D-beat alone would be doing it a disservice. Although they do largely adhere to the beat, they’re sneaky in their approach. Their sound is more pulsing and fluid than it is rigid, allowing for some wiggle room inside the otherwise firm parameters of the D. If ever there were such a thing as danceable crust punk, this is it. That being said, at just four songs, it’s about the perfect length for this type of thing. Although the tempo is engrossing it would likely wear-on a little long over the length an LP. If they ever go that route, hopefully the will employ even more improvisation. I was truly smitten with their first demo tape, and I can pretty much say the same here.